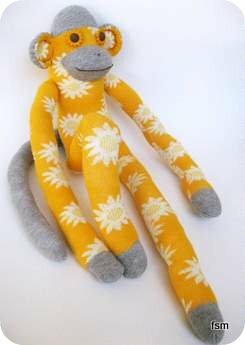 Traditional sock monkey socks are Rockford red heels but you can use any socks you chose to make sockmonkey toys, like these cute flower socks. 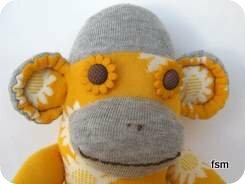 Handmade stuffed monkey toys are great gifts to share, especially custom made ones. Follow the basic sock monkey pattern and instructions to make your sock animals body, arms, legs and mouth. Eyes: Two flower button eyes the same color as the sock were stitched on. Flower buttons where chosen to match the theme of the socks. 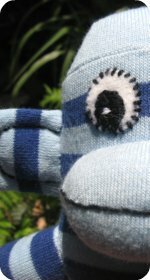 I always stitch the sock monkeys mouth on first and then everything else follows, I find that once the mouth is in position it's easier to balance everything else out. 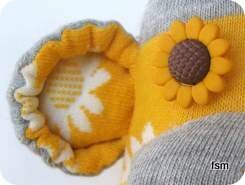 Ears: I cut out two grey ear pieces from the grey sock, for the backs of the ears, and two ear pieces from the yellow flower sock, for the fronts. 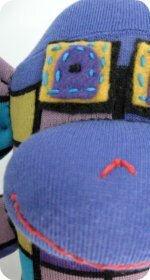 Sew them together, stuff a little and then embroider to create the inner ear. Be sure not to pull the embroidery thread tight, you should be able to see your stitches clearly. Then to get the gathered effect, run another piece of thread in between the two pieces of the ears, between the outer edge and the embroidery you've just completed. Pull the thread firmly to create the gathered effect. Secure it well and stitch on to the monkeys head. Tail: Cut a long tail from the grey knee high sock. With knee high socks you really need to use a third sock to make a long tail or else it would be super stumpy, that's if you are using the modern sock monkey pattern (as the tail is cut from the foot part of the sock). 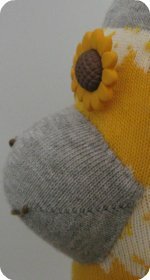 You would need only the one pair of sock monkey socks though if you use the vintage sock monkey pattern and instructions , as the tail is cut from the leg and foot part of the socks. 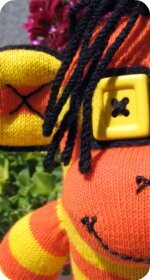 Depending on which sock monkey socks you chose to make sock monkey toys from, you may first want to figure out which of the two patterns you are going to use. 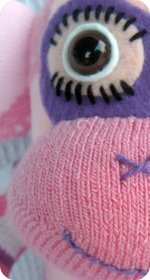 It's especially important to know because if you are going to use the modern sock monkey pattern it requires an extra (third) sock if you are using knee high length socks. If I use the modern sock monkey pattern when using knee highs, I typically chose a third sock color that is featured in the main pair. In the example on this page I chose grey as the third sock as it was the color of the heel, toe and top of the main pair I used. I also make sure I buy the same brand of sock, so the sock thickness as exactly the same and the colors match perfectly. TIP: If you cut out four separate pieces for the ears before sewing, (as opposed to sewing the ears together while the sock is still intact) it gives you the flexibility to position certain patterns however you would like. 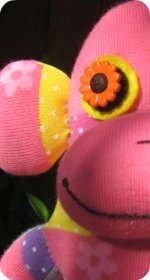 Example: In the sock monkey doll above, I was able to position the flowers near the center of her ears.